Cleaning chores are a necessary part of life, but they are also an activity that most of us want to zip through as quickly as possible. Unfortunately, some of us tend to live on the edge when we clean, creating our own version of cleaning methods that look feasible but end up adding even more work to our cleaning routine. If you often find yourself frustrated at chore time, check out these common cleaning errors and the timesaving, efficiency boosting options for improving them. When faced with a greasy stove to clean or a bathtub ring that just won’t go away, it is hard to look at the label directions without thinking that using a half-bottle of cleaner will make the job faster than the quarter cup recommended by the manufacturer, but this is where you must be strong. Using too much cleaner will not only leave residue, be difficult to rinse away and waste money, it can also pit the surfaces you are cleaning and make future cleaning chores even more difficult. Stick to the recommended amounts for the best results and add a bit of soaking time to the process for stubborn areas. Dust Bunnies Here, Dust Bunnies There, Dust Bunnies Everywhere? To win the dust bunny war, always dust with a microfiber cloth first in order to help attract and hold the dust. After dusting, vacuum the room and use the upholstery tool to quickly scan your furnishings. Investing in a HEPA vacuum will also help to remove fine particulates and indoor air pollutants. Just Say No to Splatter! When using spray bottles for cleaning or dusting, avoid splatter marks on mirrors, walls and surfaces by spraying the product directly on to absorbent microfiber cleaning cloths. Not only does this ensure the correct product is applied to the correct surface, but it creates less waste, thus saving you money on the frequency in which you replace your cleaning products. Look Ma, No Paper Towel Woes Here! Your parents may have used paper towels for cleaning chores, but you have a much better option! Instead of going through rolls upon rolls during your scrubbing sessions and adding to our overflowing landfills, invest in a few long lasting microfiber cleaning cloths. Absorbent, strong and reusable, they make quick work of cleaning and shining all the surfaces in your home. The easiest – and fastest – cleaning routines are the ones that happen frequently. Instead of putting off cleaning chores until they become a huge mess, become a stickler for wiping down surfaces as you use them and scheduling quick daily straightening sessions in heavy use areas. Remember, also, to take a break from cleaning by calling on an eco-friendly cleaning company like Mopfrog! Scheduling them to clean your home takes just a few minutes and you will soon see that those minutes were very well spent! No longer an infant, our toddlers and preschoolers seem to grow and mature, right before our eyes. While many are shy and reticent as they approach their second birthday, most become much more curious and outgoing by the time they reach the age of five. During this time, they will not only grow physically, they will also master fine motor skills, learn to think and reason, develop a well-rounded vocabulary and become more socially and emotionally mature. Challenging kids with age appropriate tasks around the house during the toddler and preschool development years is a great way for parents to help them master new skills and develop the self-confidence that will help them become successful as adults. The second year of life can be frustrating for your toddler because their emotional development and communication skills are not yet as advanced as their thought patterns. Children of this age enjoy chores such as picking up toys and placing them in baskets or bins and wiping surfaces with a damp cloth. Three year olds typically know more than 200 words and are beginning to speak and understand more complex ideas. Colors, shapes and textures are increasingly interesting to this age level and they can become quite adept at household chores that include sorting, stacking or simple folding techniques, such as folding washcloths. They can also master more complex tasks, such as using a small watering can to water flowers or put food into the family pet’s dish. By the age of four, children are much more physically adept and are able to easily memorize songs, stories and basic knowledge such as the alphabet, numbers and colors. They understand the concept of matching objects by color, such as pairing socks and like to help perform simple cooking chores, such as tearing lettuce for salads, peeling hard boiled eggs, stirring batters and rolling out dough. Five year olds are able to carry on complex conversations and express multi-faceted ideas and are beginning to have a good grasp of right and wrong. In addition, this age group is much more social and is beginning to develop caring relationships with siblings and playmates. Their more advanced physical capabilities, along with more mature thought patterns will allow them to excel at more difficult tasks such as measuring ingredients when cooking, loading the dishwasher correctly and assuming responsibility for specific daily chores, such as pet care, checking the mail or picking ripe produce in the garden. In every age group, parents should be patient and expect an occasional tantrum or display of stubbornness. However, by keeping the sessions challenging and fun, both you and your child will reap the benefits. A walk down the aisle of the average grocery store in America can yield some amazing sights, especially in the aisles where foods seem particularly targeted toward young children. Electric blue fruit-flavored drinks or ice pops, shocking pink strawberry-flavored milk, and shades of purple, yellow and green sweetened cereals with colorful bits of marshmallows. Even though we adults shudder to see these items, our kids are drawn to them like magnets. All those strange colors are usually created with synthetic food dyes, many of which have already been linked to hyperactivity and other behavioral issues. The electric blue sweet drink in the cute, single serving bottle probably uses one of many synthetic food dyes called FD&C Blue No. 1 to obtain that unnatural hue. In addition to this use, it may also show up in hair dye, pharmaceutical drugs and many other products routinely used in America today. Strangely, some of the same companies who manufacture products for U.S. consumers using these artificial dyes, are using natural food colorings for their European markets, so why not here? What Can Parent’s Do to Avoid Synthetic Dyes? As a parent, it is up to you to ensure your child’s safety, and these tips can help you learn how to avoid potentially harmful synthetic ingredients and dyes in your child’s diet. Remove as many processed foods as possible from your family’s diet. Refrain from buying products that are not representative of the fruit, vegetable or meat they are made from, such as star-shaped chicken nuggets. Choose organic and locally grown foods when shopping. Avoid GMO foods and products. 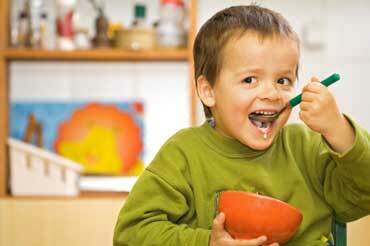 Teach your children to prepare and enjoy consuming healthy foods. Make food fun with kitchen experiments, like showing them how the addition of a handful of blueberries or strawberries to the blender can change the taste and color of their smoothie. Consider adding some berry bushes or cherry tomato plants to your garden so that kids can see them grow and understand the benefits of growing food. Make kids part of the shopping experience and help them learn how to read labels and make smart food choices.